Konrad is an author/poet. He seems to be constantly in a bad mood or just grumpy. He runs a little faster and hits a little harder than the other characters and he also has a little more health. He's not too op tho. I used the Extended Sample Character ( http://forums.kleientertainment.com/files/file/950-extended-sample-character/ ) as a base. Let me know if something isn't working. Enjoy my mod. 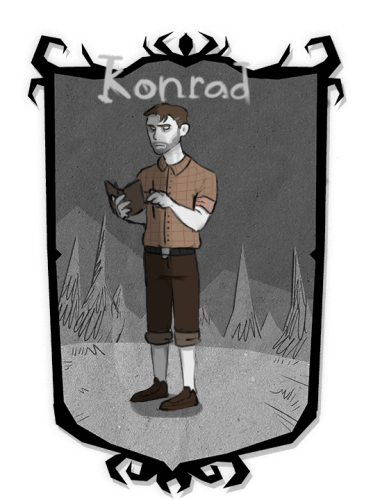 Download: Unzip the zip file and place the file Konrad into your mods folder. This is my first mod ever! The character is my own. Her name is Sanoja and she's an elfin little troublemaker but in the inside she's a true softie. I used the Extended Sample Character by Dleowolf (http://forums.kleientertainment.com/profile/465133-dleowolf/) as a base. I just hope that you people like my mod and if something doesn't work or is bugging, please inform me about that. 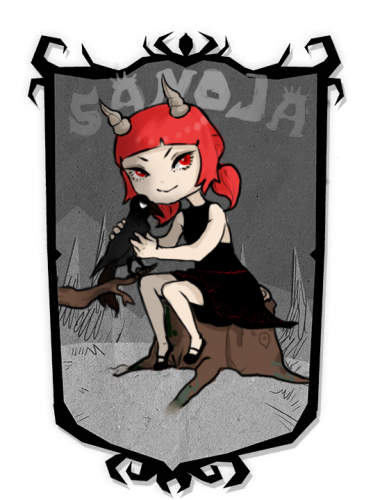 Enjoy How to download: Unzip the zip file and move the file Sanoja into your mods folder. That's pretty much it.